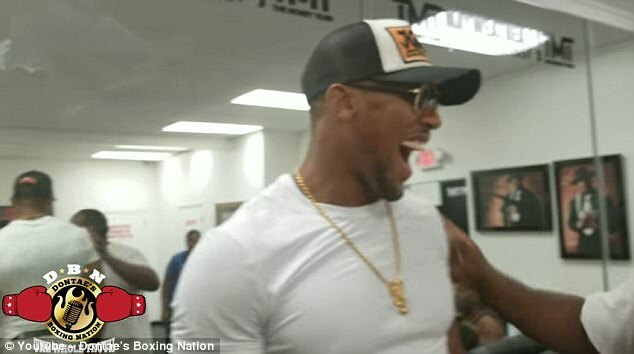 Anthony Joshua has swung by Floyd Mayweather‘s boxing gym in Las Vegas as anticipation continues to build ahead of the Money Man’s fight against Conor McGregor. 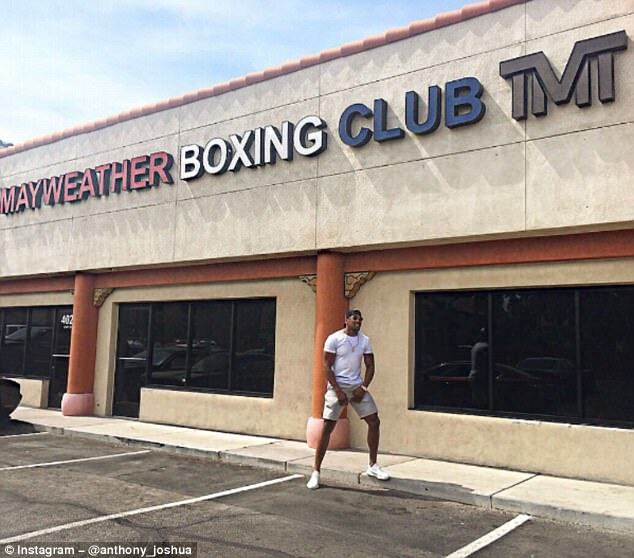 The heavyweight champion flashed a smile as he posed under the Mayweather Boxing Club, which has large red, white and blue lettering and features ‘The Money Team’ logo. 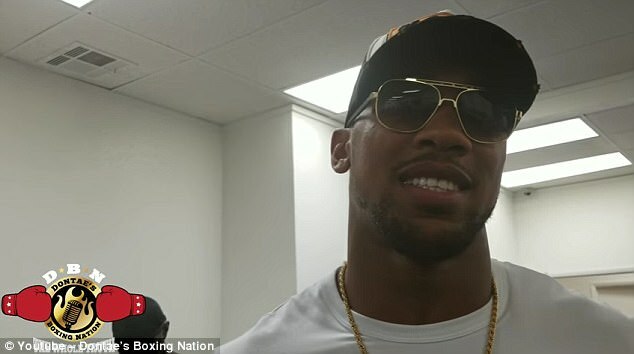 Joshua captioned the Instagram post: ‘It’s only right… AJBXING / TMT’ as he appeared to throw his support behind Mayweather for the upcoming fight. He was later shown inside the gym itself as he met with heavyweight boxer Marcellus Williams and took photos with a series of fans. Joshua previously informed Mayweather that he wanted to be on the undercard for his fight with McGregor, which takes place on August 26 at the T-Mobile Arena in Las Vegas. ‘Get me on the undercard!,’ he told Mayweather when the pair were introduced back in May. ‘That’s legendary s***, that fight will go (down) in history’. Joshua posted a video of himself on a camping trip with adventurer Bear Grylls earlier this month as he took a break from training. The 27-year-old is closing in on his next fight and says he is keen for a rematch with Wladimir Klitschko after their thrilling bout in April which Joshua won via knockout. 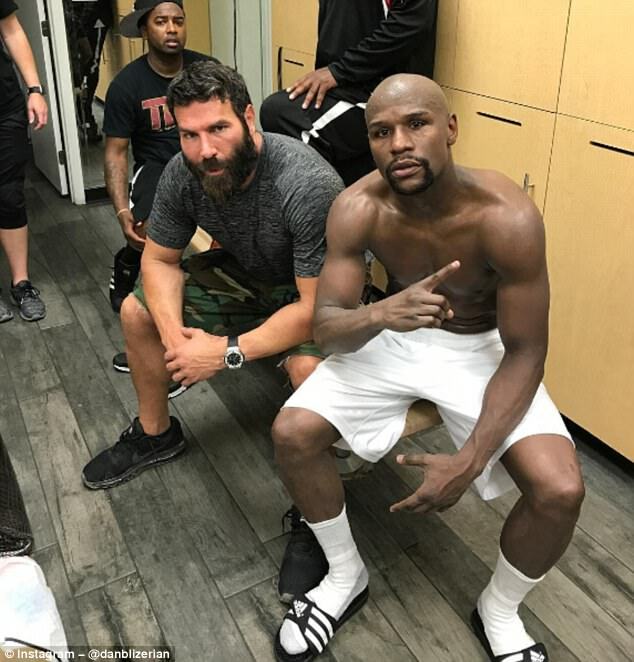 Mayweather, meanwhile, was pictured on Tuesday with professional poker player Dan Blizerian, who is known for flaunting his extravagant wealth on Instagram. Blizerian posted a photo of the pair together with the caption: ‘Money never sleeps’ as he sat beside the American in a dressing room.